Three-time Super Bowl champion Rob Gronkowski has announced his retirement with immediate effect. The New England Patriots star confirmed the news in an Instagram post on Sunday. 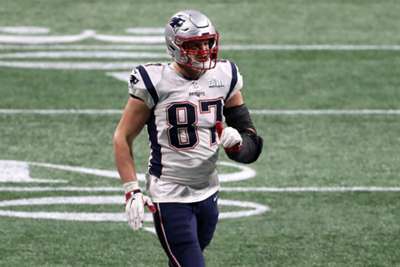 The 29-year-old tight end has been plagued by injuries during his illustrious nine-year career with the Patriots and reportedly considered quitting after the 2017 season. Gronkowski has decided the time is right to bring his playing days to an end, having played a major role in the Patriots' success. He posted: "It all started at 20 years old on stage at the NFL draft when my dream came true, and now here I am about to turn 30 in a few months with a decision I feel is the biggest of my life so far. "I will be retiring from the game of football today. I am so grateful for the opportunity that Mr. Kraft [Patriots owner Robert] and Coach [Bill] Belichick gave to me when drafting my silliness in 2010. "My life experiences over the last 9 years have been amazing both on and off the field. The people I have meet, the relationships I have built, the championships I have been a part of, I just want to thank the whole New England Patriots organization for every opportunity I have been giving and learning the great values of life that I can apply to mine. "Thank you to all of Pats Nation around the world for the incredible support since I have been a part of this 1st class organization. Thank you for everyone accepting who I am and the dedication I have put into my work to be the best player I could be. "But now it's time to move forward and move forward with a big smile knowing that the New England Patriots Organization, Pats Nation, and all my fans will be truly a big part of my heart for rest of my life. "It was truly an incredible honor to play for such a great established organization and able to come in to continue and contribute to keep building success. To all my current and past teammates, thank you for making each team every year special to be a part of. "I will truly miss you guys. Cheers to all who have been part of this journey, cheers to the past for the incredible memories, and a HUGE cheers to the uncertain of what's next."